Le Camion Qui Fume: An American-style food truck serving burgers, fries and onion rings in Paris! The Classic Burger with fries for 10€ and an American-sized serving of ketchup! Newsflash: In addition to the Eiffel Tower, the Louvre and the Seine, Paris has its first American style food truck serving hamburgers, fries and onion rings! And I love the name: Le Camion Qui Fume (The Smoking Truck). Even though this may not seem like a big deal to those of you who have easy access to burgers with all of the traditional toppings, have a bit of compassion for the American expats in Paris who subsist on baguettes, cheese and the occasional confit de canard (preserved duck). When news of the truck's opening hit Twitter a couple of weeks ago, it was hard to resist the Siren's call of such claims as "Le Camion Qui Fume makes the Best. Burger. Ever", "Delicious burgers made by a Californian chef", and"hand cut fries", so I did what I always do in these situations - I threw on my coat and dashed out of the apartment. Arriving at the Place de la Madeleine just as they were taking the last orders for the day, I overheard a couple of Americans talking about how difficult it must have been to get a license from the French authorities to operate a food tuck. Since this subject is one of interest because my son has been encouraging me to do exactly the same thing (no, thanks! ), I inquired about the complexities of French bureaucracy and asked if I could share a table with them. In between expressing delight at the juiciness of the burger and discussing the freshness of the bakery quality bun, it was fun hearing about the experiences of other expats in Paris. 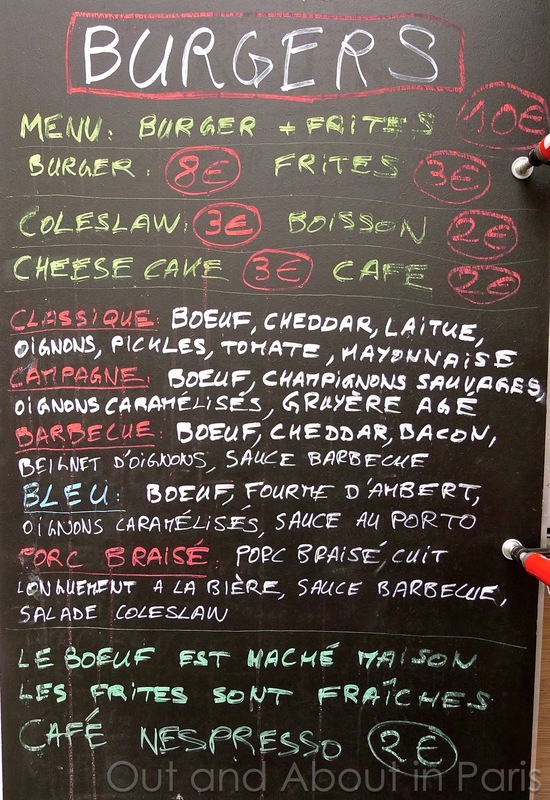 One of them, Lindsey, already wrote about "The Best Burgers in Paris" over at her blog, "Lost in Cheeseland". As she has tasted a lot of burgers during her quest to find the ultimate one in Paris, I'll gladly take her word that the hamburgers at Le Camion Qui Fume reign supreme. For those of you who prefer your burger well-done, it's helpful to know that Kirsten, the chef, serves the burgers medium-rare so that diners may better appreciate the flavor of the freshly ground meat. And best of all, for someone who craves onion rings in between visits to the States, those at Le Camion Qui Fume are homemade (or truckmade!) and crunchy - just the way that I like them. The only thing that was missing was something sweet at the end of the meal. Even though there is cheesecake on the menu, Lola's Cookies would have been perfect! Jamie and Lindsey, thanks for sharing your table with me and for making the experience all the more enjoyable. Please check their website for location because it changes daily. Craving barbecue ribs, coleslaw and pulled pork sandwiches in Paris? Try Blues Bar-B-Que. Oh my, how exciting..... Looks like McDonald's has some real competition. Of course since you (MK) crave a sweet dessert afterwards, the fact that McD's serves macarons may still be the deal breaker! If they're a good as you say, the onion rings at le Camion qui Fume would joyfully get my Euros. Nancy, I'm going to have to go back and do some more taste tests of the onion rings but the one that I tried was pretty darn good. I only had one because they were getting ready to close for the day by the time that I arrived. And as far as sweets are concerned - McDonalds doesn't stand a chance when the truck is at Place de la Madeleine cuz there's a Laduree right around the corner. Guess where I went for my dessert? Come to think of it, there's no comparison between the burgers at McDonalds and those at Le Camion Qui Fume. These are really tasty and freshly made. Plus, they serve a few different kinds of burgers, including one with caramelized onions, gruyere, and mushrooms. Stop press! They have coleslaw? That's most surprising. Being a Southern boy, I love homemade coleslaw and having it on a burger is straight out of my childhood--the best, no other topping necessary. I'm in complete agreement! Cole slaw is one of my favorites, although I can't remember having it on a burger - just BBQ sandwiches. The next time that I'm at the Camion Qui Fume, I'll have a "Joseph Burger". WOW your posting of this topic on TA got quite a ride. I figured I would stay out of that one. When i followed up with Lola`s cookies if found the link for "Drole d'endroit pour une rencontre". I notice that it was it was close to Cathedrale St Eustache. I first searched your blog to see if you had covered that location. What i found from reading the blog was different from your latest edition of your blog where we get the MK impression of what it was like. When I read your blog I look forward to your impression about what you and Stephane and family may have experienced and I did not find that in that particular blog. I can only surmise that this was one of your earlier blogs and that you are getting really good at this craft. What I found in your earlier blog about St Eustache was information but no compelling reason why i should go visit unlike the latest one where I find that I have the find the Camion qui Fume during out next visit. another visit to St Eustache/Bourse du commerce. Is a concert at St Eustache worth going to? Is the park between the Church and les Halles a good experience. So my question to you is...did you eat the burger American style with two hands or à la française with a fork and knife? It certainly did! It always amazes me how threads on TA develop a life of their own and can morph into something unexpected. Having said that, it's one of the best places to get information about Paris and there are lots of helpful/knowledgeable members. Thanks for your feedback - it's always welcome because I'm still trying to figure out what works and what doesn't. In the beginning, I was trying to be as concise as possible and to give enough information for people to make their own decision about a place. I've started adding a bit more about our personal impressions so it's good to know that you find it helpful. Plus, I visited St. Eustache with a walking tour and I've found that while I always absorb lots of information, I don't have enough time to formulate my own impressions because I'm too busy writing notes and taking pictures. So, I think that you have an excellent idea. 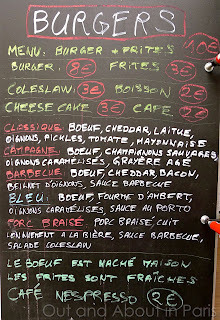 I'll gladly return to St Eustache, La Bourse and sample the burger at Drole d'endroit pour une rencontre" (gotta love that name!). WIth the holidays fast approaching, I won't get to it until next year and will try to address your questions. As far as concerts, I've heard more about the ones at Madeleine, but I'll see what St. Eustache offers. If you go anytime soon, just remember that it's cold out now! Take a pair of gloves cuz my fingers were almost numb by the time that I was finished. Too bad that MF still has your puffy coat. A "Joseph Burger", I like that.